Increasing numbers of enterprises are investing in chatbots. 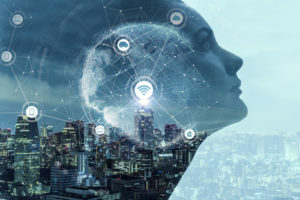 The promise of offloading expensive support that previously required human intervention to artificial intelligence-driven technologies is attractive, especially for organizations with complex, technical products and services. Chatbot frameworks have simplified the creation and deployment of these tools, but implementers struggle to extend success beyond single languages. 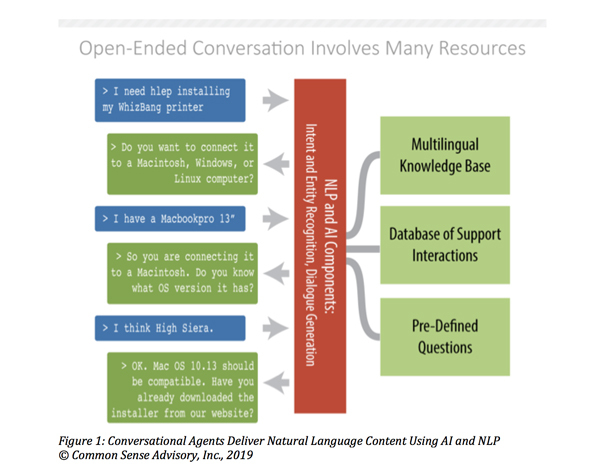 As part of a detailed examination of how enterprises leverage technology to deliver multilingual customer support, market research firm Common Sense Advisory (CSA Research) interviewed leading developers of chatbots about their experience with multilingual support. The overwhelming majority of chatbots—also known as intelligent online agents–today exist only in monolingual instances. Few companies have found approaches to deliver multilingual user experiences. Their results are inconsistent and solutions scattershot. A chatbot implementer at a large tech vendor–one that develops a commonly used open chatbot framework–stated that it anticipates at best a 30% success rate from its own efforts at multilingual development. Lack of effective international support is the norm in the first generation of new technologies: Developers are seldom experts in translation or region-specific concerns. But chatbots pose a particular challenge because they represent the intersection between technical and cultural concerns. Even if all technological obstacles were to be solved, regional and linguistic differences in how people ask for help and address problems would continue to challenge any idea that developers could simply translate apps. These challenges range from simple to complex. CSA Research has documented the ways in which enterprise content is evolving from simple unstructured documents into conversations that evolve over time and that may play out across multiple channels (chat, call centers, email, video, etc.) and that can take multiple paths. Chatbots are a particularly extreme example: They are explicitly dialogue based and need to adapt in ways that their creators may not even anticipate. In this regard, they are far more complex than traditional knowledgebases or FAQs. Consider the example below, which shows how a chat interface integrates multiple components, but must also determine conversational intent, deal with typographical errors – such as “hlep” instead of “help” – and deliver relevant answers. These issues are all complicated when you move to new languages, which exhibit their own patterns and difficulties. For example, in response to the query about what operating system the user’s computer has, she responds with a misspelling of a particular model name. The agent must identify what computer she means and map it to the operating system. In the next interaction, it has to determine what OS version is meant from a misspelling of common name that is expressed with some doubt. Although human support agents have no problem dealing with such things, algorithmically-driven devices struggle. As an example of how cultural issues can complicate even simple tasks, consider a chatbot that helps customers plan a train trip. In a typical form-based search-oriented application, the user would provide certain details – desired dates and times, destinations, desired ticket class, etc. – and then scroll through a list of possible routes. This process would not require the site visitor to log in, and only at the time of payment would it require personal identifying information. Now suppose the same application is deployed via a chat interface. A bot in the U.S. might ask “What is your name?” early on and then use the customer’s given name regularly in conversation. However, in other markets, this “friendly” style could be seen as too intrusive, insufficiently respectful, or even just “too American.” Developers told CSA Research that anticipating and accounting for such cultural differences are difficult tasks because their teams seldom have the expertise to know when they need to adjust behavior. Other, seemingly basic, features can create problems. Even asking for a “last name” can be a problem for Spanish-speaking populations, where it would be unclear what name is asked for. Filling in a postal address can be a logistical nightmare, given differences between systems in different countries: For instance, most Japanese addresses require the inclusion of city department and block numbers, items with no direct equivalent in most of the U.S. or Europe. When organizations build agents that rely on specific information, they may find that simple translation is not enough to ensure functionality. The task of removing cultural assumptions is known as internationalization, but it is a particularly challenging task for something as inherently social as a chatbot. The HubSpot marketing team found these cultural nuances caused problems with its early chatbot experiments. It converted a web-based lead form into a conversational chatbot experience. Tests with English-speaking audiences were successful, but results were unfavorable in other language markets. Offering the same—albeit localized–experience in English and Japanese did not account for the cultural differences. 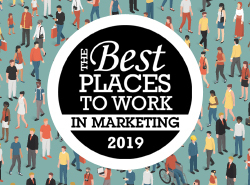 In the end, HubSpot found it needed an altogether unique playbook for regional markets. Legal and regulatory frameworks also complicate simple translation of online agents. They often gather information that can be considered personal in nature. What they can legally ask – and how they can ask it – is subject to region-specific rules, such as the European Union’s General Data Protection Regulation (GDPR). Questions considered innocuous in one market could open developers to legal action in another. In addition, many developers have yet to seriously grapple with security and privacy issues, and protocols that work in one country or language may not work or may create unacceptable risks in another. Another challenge that developers frequently face is that their internal terms and those their customers use may be very different. For example, a computer manufacturer may use terms like “CPU” or “desktop computer” to refer to the part of a computing machine that contains the processor, but customers may call it the “box,” or “the part with the disk drive.” It is already difficult for chatbots to deduce intent in such cases when dealing with just a single language. When developers must account for variations across languages—particularly for less common ones–this problem can quickly become mind-bogglingly complex. In other cases, customers may use terms in ways that are completely at odds with corporate language. For example, a developer of tablet computers would never refer to their product using another manufacturer’s brand name, but customers will regularly talk about things like a “Samsung iPad” or an “Amazon Tab.” Companies seldom capture information about such usage—and even less often in their regional markets—but knowing these non-standard ways of speaking are essential if chatbots are to respond correctly in conversations. In addition, misspellings, typos, and ungrammatical input are the norm, rather than the exception, for user-supplied content. Robust, fault-tolerant chatbots need to anticipate and deal with such problems. This is generally easier for simple, “rail-driven” agents that have a set of pre-defined paths than it is for open-ended conversational bots, but even for the simpler case, speaking in terms your customers understand can make or break a bot. Some of the companies CSA Research interviewed stated that terminology has led to project failure even for monolingual applications and that if they were starting over again from scratch, they would focus on identifying and managing terms before trying to build bots. The solution is to gather as much data as possible about terms in different languages and formally represent it. Pre-processing user input to identify synonyms can help tremendously in this regard. One of the consequences is that developers cannot simply translate an existing chatbot. 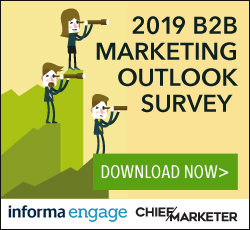 Instead they have to adapt it and create country- and language-specific resources to address issues and create an outcome that speaks to customers wherever they may be and in whatever tongue they prefer. For marketing activities, this sort of careful tweaking in which a source concept is modified to work in another region is sometimes known as “transcreation.” When applied to online agents, it means that developers cannot just use translations of user interface strings originally written in English and expect them to work in Czech or Chinese. Instead, they document intentions and re-create a separate but equivalent chatbot in the target language. Naïve translations that fail to do this will almost certainly result in lower user satisfaction and higher escalation rates to live agents. 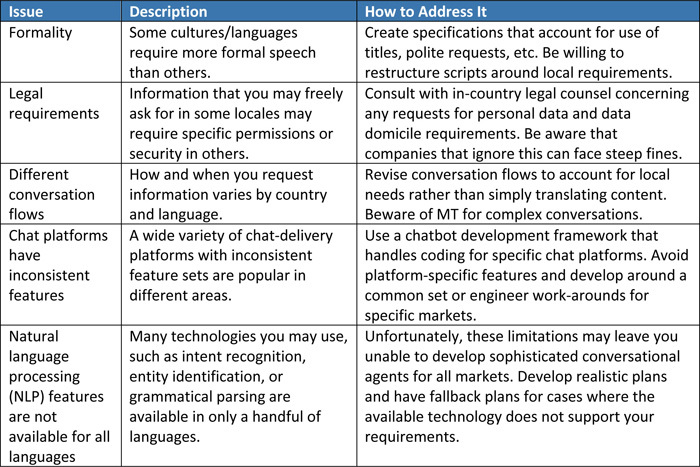 Developers told CSA Research that building multilingual chatbots is a difficult challenge because best practices have yet to emerge. However, understanding the issues that enterprises and the companies that provide language services to them must address helps increase the likelihood of success. One of the most important recommendations successful organizations have is to involve linguists and regional stakeholders from the beginning and give them power to adapt requirements and set expectations. Conduct up-front anthropological research to understand each new language or market to prevent incorrect assumptions about behavior, culture, and language. Building global chatbot programs requires tight oversight and rapid iteration. Efficient reporting and ownership structures become especially important as you work across time zones. These best practices apply to all global projects – not just chatbots – but they are especially important for intelligent agents. Developing a global-first mindset can be difficult for organizations of any size. Those companies that address these concerns after requirements are set consistently find problems. But if you plan for the linguistic, cultural, and legal needs of your markets – and invest in the needs of particular markets – you can achieve success and build chatbots that work in your various language markets. Arle Lommel is a senior analyst with CSA Research. Connor Cirillo is a conversational marketing manager with HubSpot.